March 5, 2014, 5:50 PM · Having a master class with a jury member is one way to get an idea of what details they are seeking in a competitor's playing. 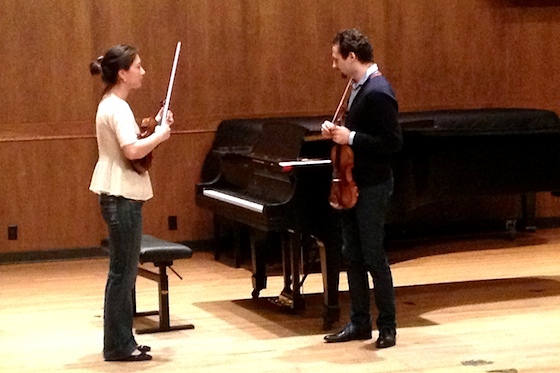 At the Menuhin Competition, all of the jurists gave master classes. We already visited the master classes given by Pamela Frank, Joji Hattori and David Kim; on the final day of the competition were three more sets of master classes by Brian Lewis of the Butler School of Music, Ilya Gringolts of the Hochschule Basel, and Olivier Charlier of the Conservatoire National Superieur de Musique et de Danse de Paris. Unfortunately, many of these classes were happening simultaneously, so I regret I could not attend them all. Particularly, I was unable to see the master class of the French violinist Olivier Charlier, about whom many students were raving with gratitude afterwards. I saw mostly the master class by Brian Lewis, with a little peek into the class given by Ilya Gringolts. The first student who played for Brian Lewis was Ari Boutris, 13, with Wieniawski's "Polonaise." After Ari played, Brian started by describing the composer, Henryk Wieniawski: "He was a very wild man with big appetites," he said, adding that he liked to gamble (even losing his del Gesù in a bet once) and to drink a little too much, er, milk. "When you play this, you have to be very wild and find each character of each section," Brian said. "Each gesture means something." The music is also full of "appoggiaturas," a great word that literally means "to lean," he said. Musically, "we're going to lean on the note that doesn't belong. Mozart is full of these," and they create musical tension. He asked Ari to name three things in his playing that he was already doing well (and there were more than that!) When Ari hesitated a little, Brian explained, "All my students can easily list what they what to improve, but you have to be able to let the things that you do well, also, and be very specific in your analysis." They came up with a list of three things he did well already, and another list of three things to improve, one of which was intonation. On the subject of that, Brian quoted his own late teacher from Juilliard, Dorothy DeLay; "Intonation is the thing you'll be doing your whole life," he quoted, adding, "you won't ever get done with intonation work!" Imagine putting three lemons between your shoulder blades, then "make juice"
Next was Esther, a student from the Butler School, who played part of the Elgar Violin Sonata. When she finished, Brian said that "I would love for you to live in a bigger box." For example, Elgar write "fff" at one particular spot; "he wants volume of sound." Brian had her play about three places in the sonata that were similar in terms of notes, but different in terms of dynamics, just to illustrate the range of dynamics needed. He also wanted more character, and one way to do that is to be more demonstrative about when the bow stroke changes in the music. Brian talked about "zero-gravity playing," playing in a position where the bow slides neither toward the bridge nor toward the fingerboard, but just rests where it is because the violin is held flat, not sloping down. Such a position allows for maximum projection; "Take your sound and bring it to everyone in the audience -- fill the space." He also talked about having a rapid bow stroke and opening from the elbow. To practice opening rapidly from the elbow, he had everyone try a karate chop, "HAH!" He said that when you perform something, really go for the "wow" factor, try to find "what makes you special with your voice." Performing is your chance to really say something; "when you are standing up performing, it's the only time people aren't going to interrupt you!" 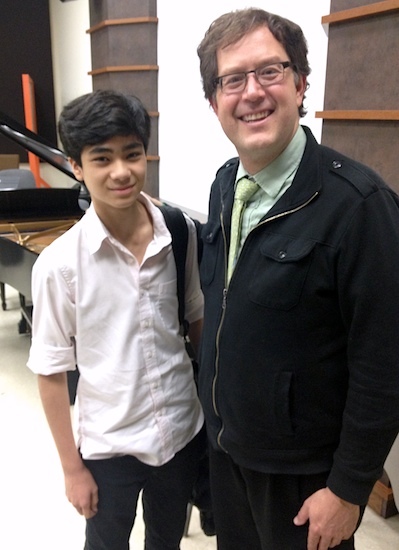 Brian answered questions at the end of his class, for example: How do you stay inspired to practice? He said he is inspired by going to concerts, and also by learning new music. "You don't have to learn the whole thing at once, start with just one phrase," he said. To make practicing more appealing: The first thing he does when practicing is to spend 10 minutes playing anything he wants, anything at all. It helps him open the violin case -- because "the hardest thing about practicing is opening the case." He said he also likes to read and learn the history behind the composers and pieces he is playing. Listening also is important. If you listen to a number of versions of the piece you are playing, "there is a history in your ear about how the piece goes." And that doesn't mean that you will wind up trying to clone the pieces you've listened to; instead it simply gives you a point of departure. Because, of course, you are going to…"study the score -- the full score," he said. One way to approach a new piece is to simply read through the whole thing and put brackets around the places you can't play. Then go straight to those places and practice them. As a student at Juilliard, he once took a challenge to learn the Sibelius Concerto in three days, with the help of his teacher, Dorothy DeLay. They canceled all his classes and went to work; he practiced eight hours a day; two and a half of those with piano. "On the third day, I had to play the whole concerto in master class!" But it taught him an important lesson: "By knowing how to organize your practice time, you can learn more and more." Keeping a practice journal can help with that, as can keeping consistent practice. He said that at one point when he was younger, he went for seven years without missing a day of practice! 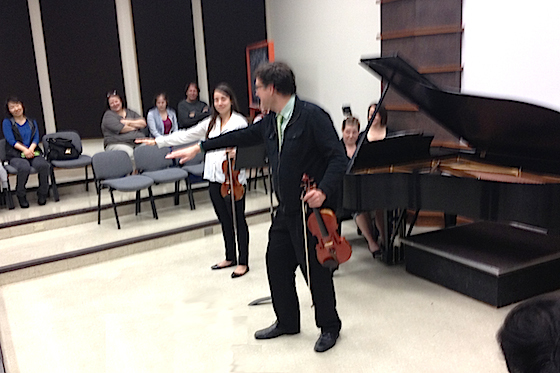 I peeked in for a few minutes for a master class given by Ilya Gringolts, who was helping a student with phrasing. The student was holding every fourth beat, without really being conscious of doing so. "It's predictable and harmful to the melody," Ilya said. "You have to think over the bar line, think longer phrases." He asked her, what is it in music that moves people? "I'm thinking of two things, he said, "rhythm and harmony. Those are the two things that move us the most in music."